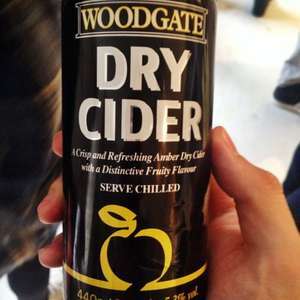 Lidl Woodgate Cider 4x440ml From £1.99 down to £1.49. Not a huge cider drinker, but I like this stuff at 37.5p per can, and 5.3%abv. Hell I like it at the normal price of 50p a can, but at this price it'd be silly not to stock up. Just realised that I didn't look to see if the pear one is reduced too, don't like it so didn't look, sorry. This cider is really nice I bought 8 cans yesterday at this price. 24x 440ml cans for £8.94 is very rare nowadays. Especially at 5%+. The bottles are £1.99 for 2L. Are you any relation to 'jase99' very similar comments! Ha ha. I bought some of this but never would have thought of posting due to the comments about it being awful. Bravo Op... Bravo! Correct,this isn't the best cider on the market,however,ice cold and drunk from a glass,not straight out of the tin,its fine.For £1.49 its a bargain and after £4.47 worth its an even bigger bargain ! Hic ! He's Jase99's brother that's slightly less prolific in posting deals!! The bottles of Woodgate Original are much nicer in my opinion. How much are you paid for marketing Aldi offers on this site and trying to down grade other supermarket offers? I haven't drank cider in years and because I'd the beautiful weather I decided i give cider a go.at 1st I tried thachers gold..lovely refreshing taste..maybe a bit to sweet, then shopping in Lidl one day I thought i try woodgate in cans. After being in the fridge for a day, I pour myself a glass with a slice of lemon, (always used lemon for acidy drinks) to my amazement I was delighted with the taste..i give it 8/10. Thachers gold 9/10..but for the price absolute bargain !